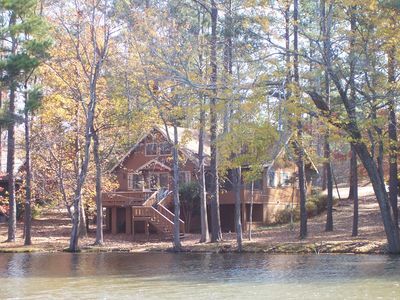 Enjoy a cozy lakefront home located just minutes from beautiful Callaway Gardens. Master has king bed and separate bath. Two guest rooms have queen beds. Lovely lake views from all bedrooms. 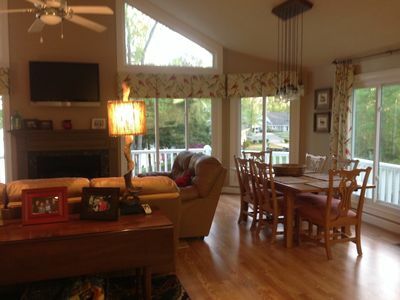 Large open vaulted family room with open view of the lake. Large laundry room, downstairs game room with pool table opens to porch and dock. Covered outdoor porches and a large dock perfect for enjoying sunsets. The home is a 3 bedroom, 2 bath. It sits on Pine Lake Georgia exactly halfway? between Columbus (Ft. Benning) and Lagrange, Georgia. There is 155 feet of waterfront? 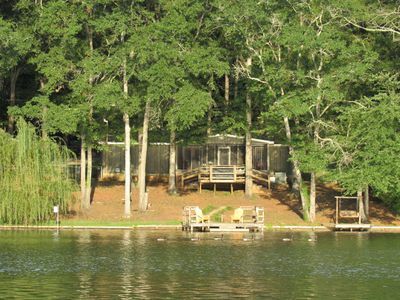 with a nice fishing/swimming dock and swing to enjoy the peace and quiet of our community. The kitchen is fully furnished and has plenty of counter space for several to be working in the kitchen. Cable TV and Hi-speed? internet is available. The back porch has an expansive few of the lake and has two tables and comfortable furniture to enjoy the view and relax. ?Fresh & New! ?2k sqft 17min to Ft Benning!? 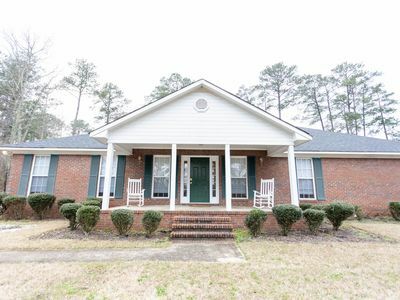 ?NEW?16 min to Ft Benning, 2200 Square ft all to yourself ? Relax in 2,200 Square feet on a private lot all to yourself. 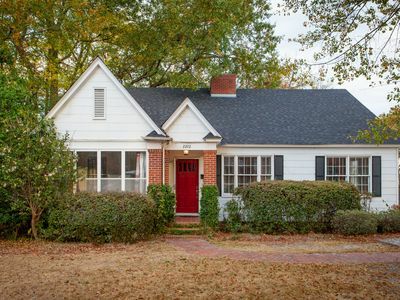 This brick Ranch style property has everything you would have at home. Enjoy the fully functional kitchen, dining area, 3 bedrooms with fresh linens on queen beds, living room optimized for entertainment, 2 full bathrooms completely stocked with towels and FREE toiletries, patio entertainment area, garage parking, laundry room and much more. 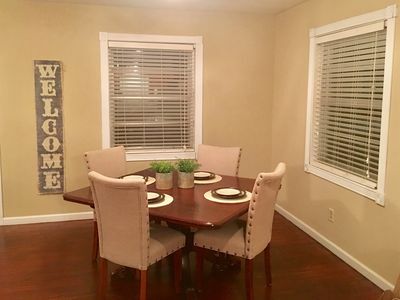 16 minutes to Ft. Benning, 8 minutes to areas major dining, shopping and entertainment. ?Fresh & New! ?2k sq ft 17min to Ft Benning!? My place is close to Callaway Gardens, Great Wolf Water Park and 20 minutes from Auburn University and Football games. My place is good for couples, solo adventurers, business travelers, families (with kids), and big groups. This Home Is Sitting On 3.82 acres in a very private setting. This Home Has Been Renovated Throughout and Has A Large Gourmet Kitchen, With Custom Imported Counter Tops, Double Oven and Grill, Large Double Refrigerator, Wine Cooler A Large Gourmet Chef's Island, Large Dinning Room With Fireplace, Beautiful Foyer Entrance, Formal Sitting Room, Library With Built in Bookshelves, Beautiful Custom Built Staircase Leading To Three Large Bedroom Each With It's Own Private Bath. the Master Bedroom Has A Built-In Fireplace, Large Private Bathroom and Walk-In Closet With Changing Room, This Home Has Many More Extras That You Must See To Believe. ?17 min to Fort Benning!? 3000 Square feet! ? ?17 Minutes to Fort Benning! ?3000 Square feet! ? Apartment is a part of a quadruplex in a very nice and safe community with a swimming pool. Kitchen, dining area, and livingroom are all open. Brand new furniture in all rooms. Master bedroom has a door to a small balcony and is furnished with a queen size bed and has its own bathroom. Second bedroom has 2 twin beds, but can be converted into a king-size bed. Washer and dryer are provided in the unit. Kitchen has everything you need - all appliances including microwave, blender, toaster, mixer, and coffee pot. Brand new 48" smart TV in the livingroom. Wifi is provided. Unit is upstairs and has a nice size balcony with a couple of chairs for relaxing. Apartment becomes available around December 8th. Thirty day minimum required. Enjoy family at this wonderful North Columbus 3 bedroom, 1 bath home! The Funky Flamingo is complete with Tv's in every bedroom and den. Private partially fenced in backyard and just minutes from Benning. You will love the coffee bar and totally equipped kitchen. You will be able to cook a feast. Netflix, Wifi and Local channels. White Water, Fort Benning and Callaway Gardens are just a few things you will want to visit. We look forward to your visit! 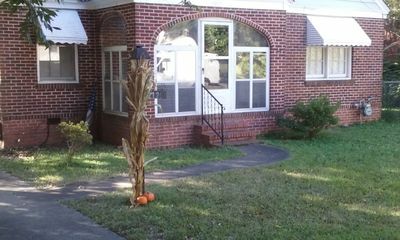 Charmingly Quaint Yet Modern 3 BR Home Near Ft. Benning & Columbus State Univ. 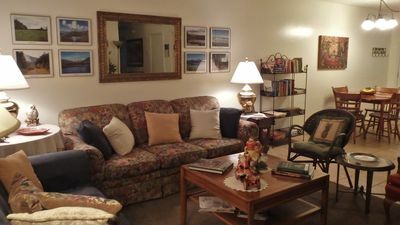 Fully furnished, house able to sleep up to 8 people comfortably. Fully furnished kitchen & patio has a gas grill & picnic table. 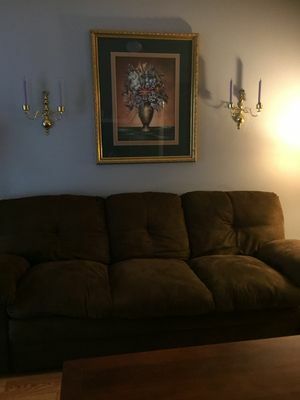 Property has (3 bedroom + sleeper sofa) , and 2 full bathrooms. Located in NE-Columbus approx 15-18 minutes to the front gate of Ft Benning. 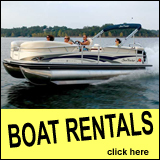 Easy access to most any location in Columbus or Phenix City within 15-20 minutes by car. 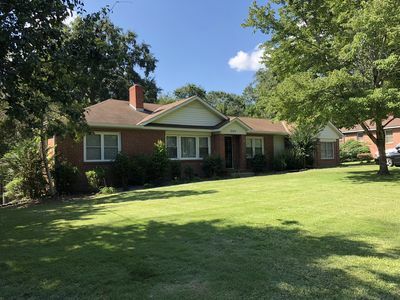 Property is located on a 1/2 acre lot with lots of dogwoods,azaleas,red bud trees and camellia bushes in spring.Plenty of parking for up to 5 vehicles. Close to Columbus Park Crossing shopping & restaurants are all within 1 mile. Movie theater as well as most major car dealerships are with in 3 miles. Approximately 35 minutes to Callaway Gardens Resort, 15 minutes to "Uptown" & "White Water Rafting & zip line over Chattahoochee River. Approx 90 miles from Atlanta Airport. Groome shuttle is available to & from Columbus. Lots osf our guests are families coming to see their soldier graduate from Ft Benning training. House is stocked with cards, board games & dominoes. Extra tables & chairs are in the laundry room Owner-host just completed a major renovation, it's so nice my wife said "When are we moving in?" Location, location, location - just 10-15 minutes from Ft. Benning, half a mile from St. Francis Hospital and BC/BS, and 2.8 miles from the Columbus Airport, AFLAC, and TSYS. It's not the Hilton, but it's a full, private home for your use! Fully furnished with all of the comforts of home. One bedroom has a queen bed, and the other has a full size bed. Enjoy sipping your coffee, tea, or wine on the front porch. Back yard is fully fenced in. Back yard has the "Grateful Shed" for hanging out in. Just a funky covered outdoor space with picnic table and grill. Enjoy whitewater rafting or zip lining in/over the Chattahoochee River. Callaway Gardens is in the next town over. Columbus is the 2nd largest city in Georgia. 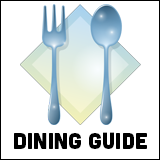 Enjoy the finest restaurants, bars, and entertainment. Enjoy a laugh at the comedy club - just a 10 minute drive. 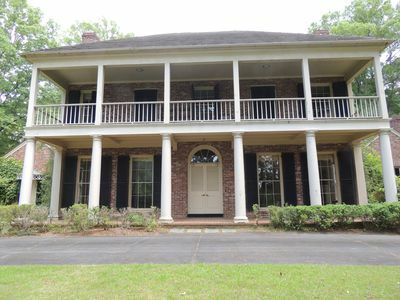 Historic home near Fort Benning. 3 bedrooms. 2 bathrooms. Sleeps 8. Decorated in grey and blue. 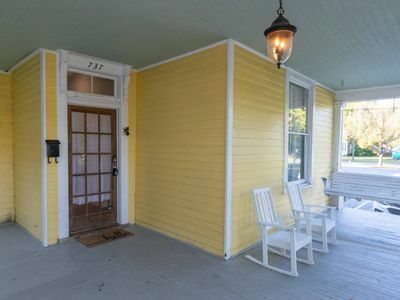 Large front porch. Fenced backyard includes outdoor eating area and small grill. We provide some coffee, soaps, and shampoos to get you started. WiFi and cable. Need early checkin or late checkout ? Just ask. We do our best to accommodate. Self checkin. Just 8 miles from Fort Benning. Thanks for staying with us! Enjoy your morning coffee relaxing in a screened-in gazebo wondering if you are in the country, all the while knowing that you are just minutes away from CSU, shopping, Starbucks, Chick-fil-a, downtown Columbus and Ft. benning. Our home is perfect for family gatherings, or a single traveler. 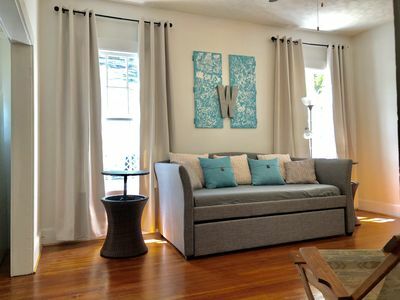 Enjoy your stay in a recently remodeled 1900 square foot home with all the comforts of home. 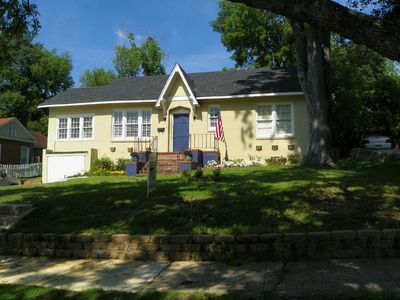 A short 13 minute drive to Fort Benning’s main gate, this home is a wonderful place to celebrate your soldier. ?13min to Fort Benning!? 1200 Sq ft! ? 1200 square feet all to yourself fully stocked kitchen, dining room set for 5 comfortably, new updates, washer / dryer, fenced in back yard for the pets, high efficiency air conditioning and more 13 minute drive to Ft. Benning as well as 5 minutes to many of Columbus’ major shopping, dining and entertainment locations on Whittlesey Blvd. 14 minutes from down town as well. Come on over! ?13 Minutes To Fort Benning!? 1200 sq ft! ? 1200 square feet all to yourself fully stocked kitchen, dining room set for 5 comfortably, new updates, washer / dryer, fenced in back yard for the pets, high efficiency air conditioning, plenty of parking and more 13 minute drive to Ft. Benning as well as 5 minutes to many of Columbus’ major shopping, dining and entertainment locations on Whittlesey Blvd. 14 minutes from down town as well. Come on over! Comfort and charm combine in this cheery three bedroom, one and a half bath home in North Columbus. 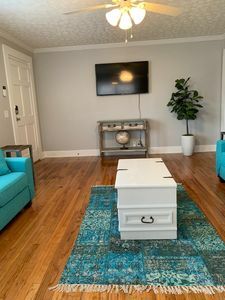 Conveniently located near shopping and dining and only 15 minutes from Fort Benning, the Happy Hippie is the perfect home base for your trip to Columbus, GA. This home is fully stocked with cooking essentials and a coffee bar. 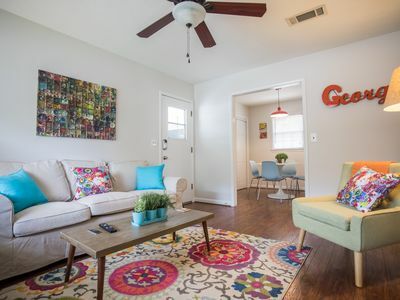 With so many amenities, you’ll be happy to call the Happy Hippie home! Whitewater rafting, Callaway Gardens, Fort Benning, the Springer Opera House and excellent shopping and dining are just a few of the great things to visit while you're in Columbus. We hope you enjoy your stay! ?? Apple TV ?? Free parking, soaps, towels, linens ?? * Close to parks and trails, shopping, and restaurants while still quiet in a neighborhood with little noise and cars. 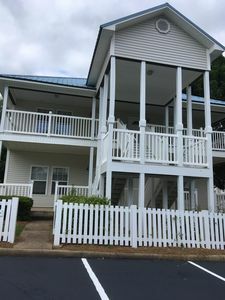 * 12 minutes to Ft Benning * Big private back deck for outdoor relaxing *Large 55inch flat screen TV with cable, Apple TV, Hulu, Netflix *Suitable for longer stays of three weeks or more * Three bedrooms, one bed in each bedroom to include king, queen, and queen *Pets allowed *Cable, Internet, Netflix, and Hulu proceeded. *Free parking under the single carport. 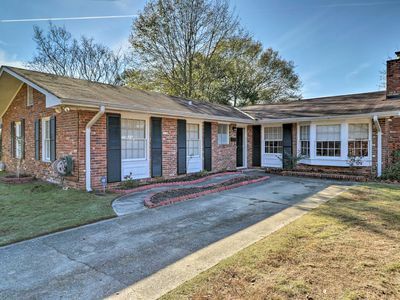 This sweet home is located in North Columbus, 15 minutes from Fort Benning and Close to shopping and resteraunts. Right across from a small park with grills, picnic tables and a swingset, this home is ready to make your stay fun for the whole family. Enjoy cooking in the large kitchen with everything you need and a fully stocked coffee bar. Enjoy cable and netflix. Sit outside and have a glass of wine on the deck or have a family football game in the large fenced in backyard. Welcome home! 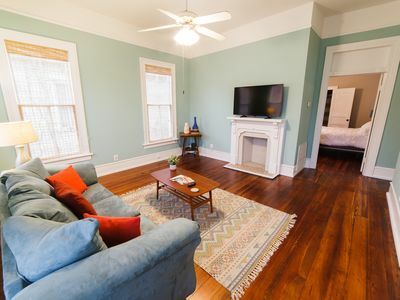 Our family friendly home in the historic Park District in Midtown is a great place to stay while you visit Columbus! The three bedrooms are spacious and comfortable. The large kitchen is well equipped for the times you prefer to stay in for a home cooked meal. In addition to the living room, there is also a cheerful sunroom, providing plenty of living space for your group to spread out and relax. The living room has a large screen tv, wii with games, and Netflix, along with high speed wifi. The dining room seats six, and the deck also has a table and chairs. The back yard has a privacy fence and is well shaded, a wonderful place to relax and play. The house is less than a block from a lovely, active park that has a large playground, tennis courts, walking path, and wide open spaces. Built in the 1940's, the home is full of charming architectural details, including hardwood floors throughout and crown moulding. 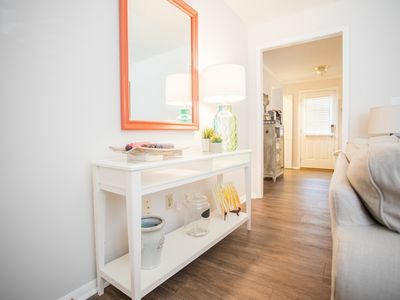 The location is convenient to the best of Columbus and Ft. Benning (10-15 minutes) making it ideal for a fun getaway to our vibrant downtown or to celebrate your soldier or CSU graduate! Callaway Gardens is just 40 minutes away as well. One bedroom has a queen size sleep number bed, another has a king size bed, and the third has a twin size bed. The living room sofa is incredibly comfortable to sleep on as well, expanding the sleeping capacity to 7 if both the sofa and pack and play are utilized. The bedroom with the king size bed has a TV with DVD and VCR. There is also a booster seat, bouncy seat and a few toys to make travel easier for those with little ones. The driveway provides off street parking for three vehicles. We love living in our hometown of Columbus, and are happy to offer restaurant and activity suggestions for your time here. There are certainly many wonderful choices! Please note, we understand special circumstances, especially involving Ft. Benning schedule changes. We are willing to be flexible with our customers. This iconic 3,500 sq ft mansion has been a cornerstone of Columbus since the Civil War, but modernized to offer the highest luxury. 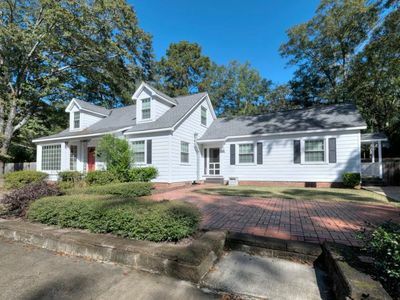 Whether in town to visit loved ones at Fort Benning, traveling on business, or simply looking for a weekend getaway, this home is perfect! Nestled in a beautiful community just 20 minutes from Fort Benning and less than 10 minutes from the riverfront and downtown Columbus, the location can't be beat! 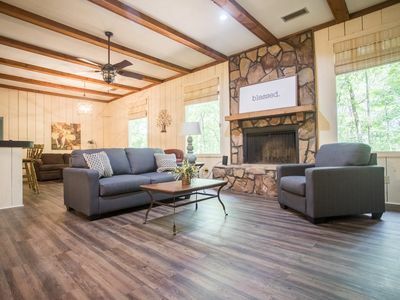 After you finish exploring, come home to a front porch swing!Whether you are wanting to relax on the front porch, grill out in the back yard, detox in the jacuzzi, or cook a big meal in the kitchen, we want this to be a cozy home away from home. 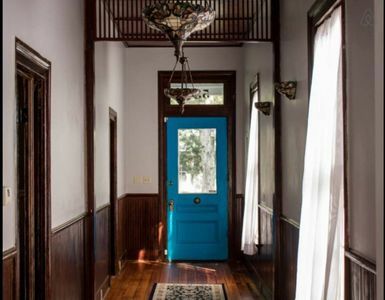 Fans of historic homes will love the stain glass, original floors, and other details. The kitchen, bathrooms, and bedrooms are all fully furnished and complete with all amenities. 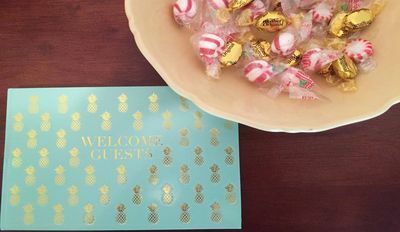 This place is great for family reunions or hosting events, as well.My wife and I live in another house downtown and are available if guests have any questions, but typically we just leave a key outside. 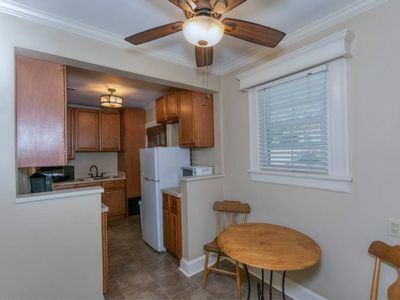 Charming two bedroom, one bathroom bungalow in Midtown Columbus. Our home is furnished in an eclectic vintage style, making for an inviting and comfortable space. Built in 1923, it retains much of its original charm, while providing modern comforts. Cozy living room with 43" TV with Roku where you can stream using your accounts. Beautiful screened in front porch, with an open porch off of it as well. Guests are welcome throughout the entire property, with the exception of the storage shed in the back. If you have items that you need to store during your stay, please message us and we will try to accomodate you! We live a couple of blocks away and can be available as little or as much as you would like, in most instances. We have a family of our own and know what it is like to travel as one, and want to make your stay as comfortable as possible. If we can provide anything to improve your stay, please let us know! We may be able to be flexible on check-in and check-out times if no other reservations are booked for immediately before or immediately after your stay, so please message us to inquire. PET POLICY: Well behaved, pets are welcome to stay, with an additional $20 pet fee per stay, maximum of two pets. Please message us prior to booking if you have a request for extra pets, and we will do our best to work with you. We ask that pets are not allowed on furniture or linens. We also ask that all pet waste is cleaned up and disposed of, both on our property as well as others'. We have a large trash can located next to the house near the driveway where bagged pet waste can be placed. We ask that you do not bring destructive pets - including those who chew on furniture, scratch, or otherwise cause damage. 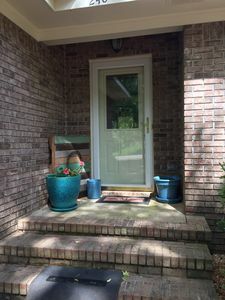 Lovely mid-century 2 BR and 2-1/2 BA brick home in well established Weracoba/St.Elmo sidewalk neighborhood with 80-year old hardwood shade trees, and one block from the Weracoba Greenspace city park and manicured athletic fields, 17 blocks from the Chattahoochee River White Water attraction, 15 minutes to Ft. Benning, and 45 minutes to Callaway Gardens. Our home was completely renovated in 2006 with hard wood floors, bright dine-in kitchen with IKEA table & chairs and breakfast bar with IKEA bar chairs, spacious living room with plush IKEA slip cover chairs and love seat, powder room on the main, front sunroom with wicker chair and ottoman for reading, large master queen size bedroom suite on main with plush IKEA slip cover chair and ottoman and claw-foot tub & shower master bath, huge 2nd floor bedroom with two queen size iron beds, large backyard deck with BBQ grille and Sunsetter shade, private fenced backyard with lush Saint Augustine grass for bare feet, roses for the table, southern life style magnolia tree to put you in the mood for those lazy summer afternoons, and elephant ears for that tropical ambiance. Our home has two heat pump HVAC systems for your comfort and lots of natural light for a bright mood throughout the house and Venetian blinds for privacy. 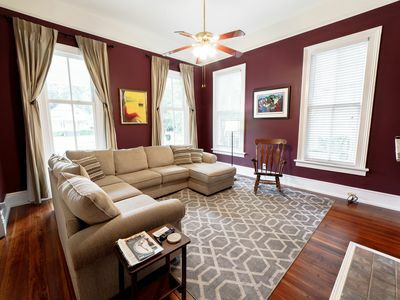 Just relax and enjoy the slow pace of the neighborhood or checkout the historic waterfront area with the brick paved Broadway mansions or visit the fantastic Infantry Museum and IMAX theatre. And oh the restaurants...Rose Hill Seafood with those fresh Apalachicola oysters, the Butcher Shop lunchroom with rib eye steaks that you dream about, or Deorios Pizza Shop that's stuck in the 70's...Bon Appetite! Fully furnished with all utilities included plus Cable & WiFi, 3 Flat Screen TV's, Fire Place, Queen Beds, Large Patio, Updated Appliances. All dishes, pots & pans, small appliances, linens, towels, etc. furnished. Just bring your clothes and food. Excellent location. Walking distance to Papa John's and other restaurants. Easy access to everywhere via JR Allen Bypass or Manchester Expressway. 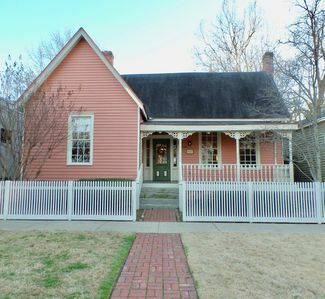 This beautiful 1800s home is just a short stroll to downtown restaurants and attractions, and only 15 minutes to Fort Benning. Whether you are attending a military graduation, traveling for business, or just here to soak up the rich culture of Columbus, you will love this Southern classic! It's the perfect place to relax, explore, and fellowship. If you are traveling as a big group, book the apartment in the back, too, and sleep 11! This secret getaway is nestled in the center of Columbus, but secluded from hustle and bustle of downtown. Relax on the back porch, cozy up to the fire-pit, or soak-up the natural light that floods the whole apartment. t is only a short walk from downtown and only 15 minutes to Fort Benning. If you are traveling with a bigger group, you can rent the other half of the house, too, and sleep 11! The fireplaces no longer work, but the add to the historic character of this great home! 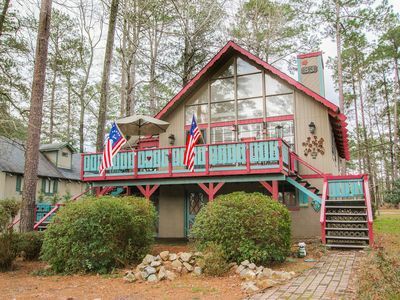 This Birdie Nest is a lovely mountain chalet style home sitting on a 12-acre lake in a resort located in Pine Mountain, GA and called Pine Mountain Club Chalets(PMCC). This is a charming well established property, perfect for a getaway or family trip. Lots to do in the area all year round - in Winter enjoy a the areas’s light show, Spring witness beautiful blooming dogwoods and azaleas and visit Callaway Gardens; in summer have fun around the lake and pool, and in Fall watch the beautiful Fall color. Plenty of windows and location make this an inviting environment during all four seasons. Large Enough for Your Friends & Family-Perfect Place To Getaway! Welcome to our chalet tucked in a green forest and set beside a shimmering lake at the foothills of Southern Appalachians. The development called Pine Mountain Club Chalets Family Resort and Conference Center, consists of over 100 chalets surrounding a 12 acre lake built with its own Bavarian design, keeping the overall plan as that of an alpine village. Enjoy Lake Innsbruck, a private lake with docks, boats, and canoes moored around the lake for the guest's convenience. Fishing in the lake is great. Experience Uptown Columbus as the locals do and walk anywhere you need to go! 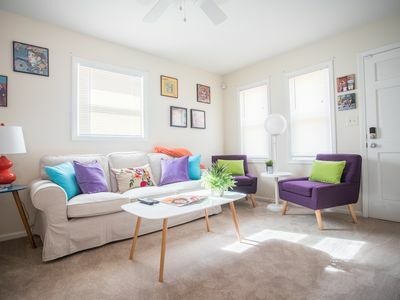 Perfect for families or groups, our space has 2BR/2BA to accommodate 6 or more people, fully stocked kitchen, and even more luxuries to help you recharge and refresh. With the Riverwalk, coffee shops, parks, & restaurants only a block or two away, you'll be in the heart of Columbus's best neighborhood. Located 7.5 miles a short 10-15 minute drive to Ft. Benning. Entire house available to accommodate up to 10+ people. 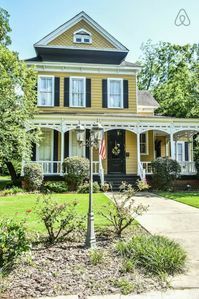 Built in 1871, this fully renovated Victorian home has all the true markings of southern charm with modern amenities. The downstairs apartment of this grand house is a graciously appointed, 1,700 square foot, two-bedroom, two bathroom unit that is ideal for any retreat, business stay, or tourist vacation and sleeps up to 6 people comfortably. Gorgeous, original heart pine hardwood flooring ushers you into the light-washed beautiful living area which boasts a large comfy sectional and features a 50-inch Smart flat-screened TV with Netflix included. Adjacent to the living room is a light-filled kitchen equipped with modern stainless-steel appliances and everything you’ll need to whip up a meal. You might even enjoy your meal on the front porch that has an outdoor seating area and plenty of room to take your meals or morning coffee. Guest access The entire downstairs apartment is yours to enjoy in total privacy. 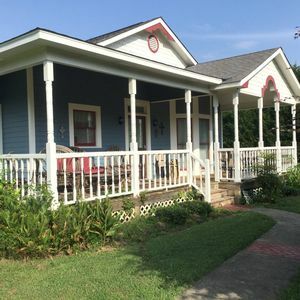 Guests can enjoy the large front porch and on site parking. Interaction with guests I live and work in Columbus. I'm happy to provide suggestions on things to do and places to eat in the area. Please don't hesitate to reach out if there is anything I can provide to make your stay more comfortable. 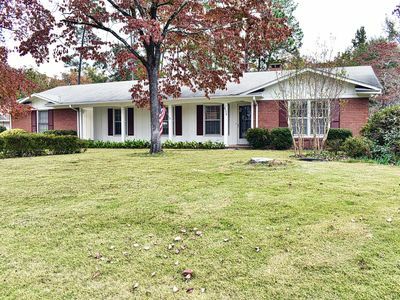 Less than 10 minutes from Fort Benning, this beautiful home is the absolute closest and best place to stay if you are visiting a soldier at Fort Benning or just checking out Columbus! In fact, the house is situated on the entrance to the old Camp Benning back in the 1800s. 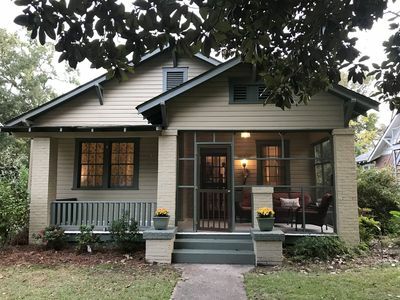 This historic home offers a modern kitchen, beautiful dining room, relaxing living area, and comfy beds...it's the perfect home away from home. We are also a military family, so we love hosting other families! This classic guest cottage can comfortably accommodate four and offers basic kitchen amenities expected in an executive rental. You will share the driveway and a large back yard with the main house, but they are separate properties. Only minutes to Fort Benning, downtown, and restaurants, it's perfect for short and long-term stays. Also, feel free to book the main guest house together. Whether here for business, vacation, or to visit Fort Benning, we would love to host you! This newly-renovated Civil War home is right in the heart of historic Columbus. It is just a few minutes walk from the Riverwalk, Convention Center, and all the best restaurants and bars in Columbus. Less than 15 minutes from Fort Benning, it is perfect for people attending military graduations! In fact, we are a military family, and this was our home when we lived in Columbus, so we love hosting other military families. Regardless of what brings you to Columbus, we would love to have you!We renovated the house when we were stationed at Fort Benning. The home has magnificent 14-foot ceilings, and we just re-finished the original heart pine floors, which date back to the mid 1800s. They are stunning! The bathrooms were also all completely renovated, and feature sleek walk-ing showers. The master bath also has an original claw foot tub! The property has a formal dining room, along with an open-concept living room and kitchen, in case you decide to eat-in instead of dining out. And if you want to get real fancy, there is a full China set! In the living room, there is a big screen TV. We don't offer cable, but there is Roku and internet, so you should be able to access Netflix, Hulu, or any other online or streaming service. On the front porch, you will find a relaxing swing and sitting chairs. We had many fond evenings sitting out on the swing! And the back yard has a great fire pit and sitting area, as well. There is also a charcoal grill if you want to grill out.As I mentioned, we are a military family and have moved to another duty station. However, one of our friends, Carly, manages the property for us. Her husband, Tony, served with me in Afghanistan, and she works on Fort Benning. You will be in great hands with Carly, but don't be surprised when you hear from her instead of me. Chosen as one of HomeAway's top performers and Premier Partners !! We have been chosen as one of HomeAway's top Premier performers and will be featured in their new marketing plan. Imagine a place where you could experience the magic of Christmas year round whether you are visiting Fantasy in Lights at Christmas or the beach at Callaway in the summer. the spirit of the season continues on. We are certain your family and friends will always remember their stay at our Christmas Year Round Resort!! 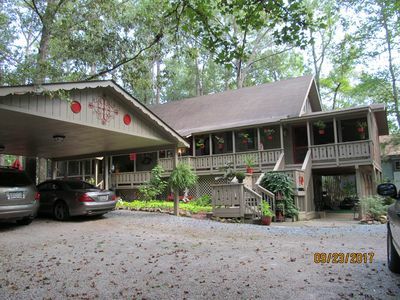 Luxury Chalet 3 Bedrooms and 2 full bathrooms and only two minutes from Callaway Gardens. Spring is here in beautiful Pine Mountain GA. Come and enjoy all the activities here in the complex, Miniature golf, beach volleyball, pool table, fishing, biking. So much to do!! Callaway Gardens is just one minute away! Our home will comfortably sleep 8; with one King sleep number bed and 2 queen beds. and a Lazy boy sleeper sofa in the living room. Two full bathrooms. Our kitchen fulfills any need. We have a laundry room and a breakfast nook over looking the lake. Our living room has a large entertainment center, and 5 hd tvs throughout the home. And a Kids Corner, too! For the golfer there is your own Man Cave with putting green! 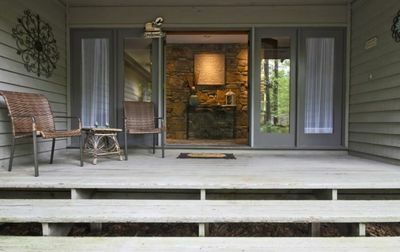 High porch deck for true relaxing, overlooking our great fishing and boating lake. Just outside our complex there is Butts Mill Farm with horse back riding and more, Wild Animal Safari, (you ride around in a zebra-striped trolley and the animals are free) FDR's Little White House and Museum in Warm Springs (a quaint little town great for shopping), Also, Fort Benning has a new fantastic Military Museum you guys really don't want to miss!! To see and do everything it would easily take over a week!!. We hope to see you soon! 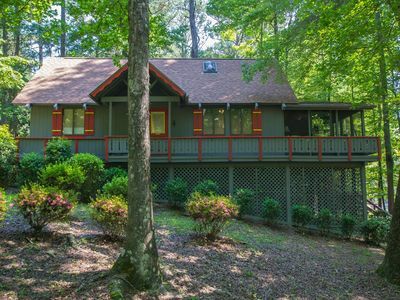 Luna Landing #79 is a recently updated mountain chalet style home situated in a forested setting, overlooking a 12 acre lake in a resort called Pine Mountain Club Chalets (PMCC). This is a beautiful well established property, perfect for a romantic getaway, or family fun. Enjoy a cozy fire during the Winter, witness beautiful blooming dogwoods and azaleas in the Spring, have summer fun around the lake and pool, and watch the beautiful Fall color when Autumn arrives. Luna Landing (Chalet #79) is one of the largest and most popular rental homes in PMCC. An addition to the home added a large master suite, a screened porch, and a spacious laundry room. Hardwood floors throughout the home and plenty of windows, along with firewood provided for you for the fireplace, make this an inviting environment during all four seasons. There is cable TV with HBO, and it is a great setting for watching sports if that is your interest while you are vacationing with us. Lynn Luna and John Wilson are the owners of the home. Ms. Luna, for whom the home is named, is an artist and has decorated many of the walls in the chalet with her paintings of florals and landscapes. The 1 mile walk or bike around the private lake is a delightful experience, with the many views of nature throughout the property. On the walk, you will pass community areas for basketball, volleyball, ping pong, mini golf, tennis, and a lovely swimming pool. For fishermen, the lake is stocked with bass and bream, and there are fishing boats provided. We provide paddles, several life jackets, ping pong, badminton, putters and golf balls, horse shoes, and a basketball. (Bring your own tennis and fishing gear)! The area around this property is full of great things to do for all ages. Callaway Gardens is an amazing natural resort, described elsewhere in this write up. You may drive your family through the Wild Animal Safari and feel like you are on an African adventure. Warm Springs is a beautiful little town. There is a winery that gives wine tastings. There is much to learn there about the Franklin Roosevelt era, with the Little White House, and the Springs he loved. Roosevelt State Park is built around the largest mountain outside of North Georgia, Pine Mountain, and there are many scenic spots and hiking trails. The stables offer riding around lakes or up mountains. After a visit to Luna Landing, you will be relaxed and refreshed, and reconnected to Nature. We promise. Master bedroom has a King bed and a nice connecting full bath. Second bedroom downstairs has two twin beds and a nearby small bath with shower. Upstairs, there is a bedroom and full bath with a custom shower, and a queen sized bed. 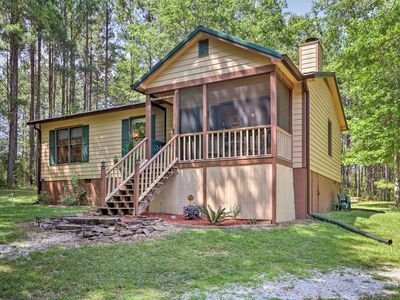 Great Safe Secluded Get Away, Newly Remodeled 3 Bedrooms, 3 Bathrooms, Nice Screened In Porches, Quiet Location,spacious Rooms, Great For Couples Or Family Reunions Or Retreats. Enjoy The Swimming Pool, A Fishing Lake With Canoes, Nice Tennis Court, Putt-putt Golf, Recreation Room With Pool Tables And More. Walking Trails For Walkers. 65 Acres Resort Located 1 Mile From Callaway Gardens.1 Mile From Downtown Pine Mountain. Great For Daily, Weekly, Or Monthly Stay. Mountain Creek Villa 1601 is set in a secluded, forested environment and offers privacy with a luxurious touch. This 3 bedroom, 3 bath spacious smoke-free unit is a private dwelling with 29" doorways. There is a king bed in one bedroom and two queens in each of the other two bedrooms. It features an expansive living and dining area, a fireplace, fully equipped kitchen, washer and dryer, and deck. This Villa offers a beautiful natural surrounding and is rated as a deluxe unit. 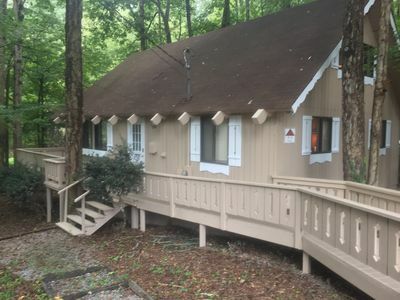 Lease this duplex in Pine Mountain Georgia. 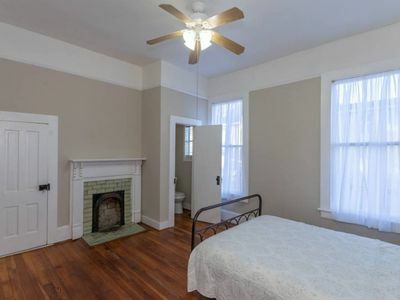 One spacious bedroom features a queen sized bed and a half bath. A second smaller light filled bedroom has a full sized bed. The third bedroom has two charming twin beds. A full bath is located off the center hall. The comfortable living room is decorated with photographs of Alaska taken by the Smith's talented son. The kitchen is ready to be used with appropriate furnishings and a washer/dryer. A TV, DVD, movies, books and board games are provided. Just blocks away from beautiful Callaway Gardens and the adorable town of Pine Mountain, GA. Just 10 minutes from I-185. 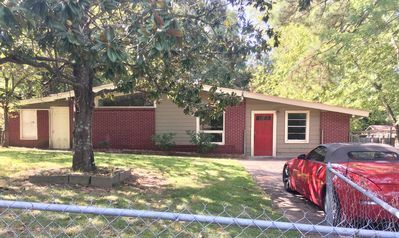 Beautifully remodeled with hardwood floors throughout, granite countertops and a private fenced back yard. 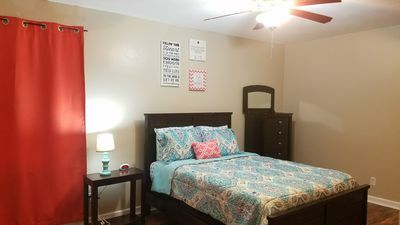 Enjoy 2 King sized beds, 2 full baths. Fully furnished with everything you’ll need for every season. Covered back porch with gas grill, ceiling fan, lights, porch swing and rockers. Netflix and Hulu available on 2 large screen TV’s. 1675 square footage with carport entry. Fire pit and hammock in the privacy of the back yard. Enjoy an outdoor shower and bathe in an antique claw foot tub in the privacy of the back yard. Complete with hot and cold water. Walk or bike around town or use our golf cart to shop and dine. 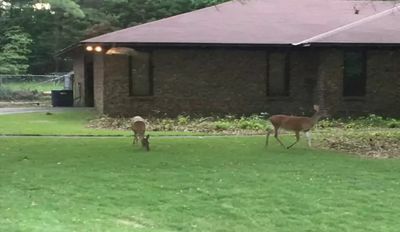 FDR state park is just around the corner, about a mile, with hiking trails, horseback riding and swimming in the Liberty Bell Pool. Beautiful overlooks such as Dowdell’s knob, known for President Roosevelt’s frequent visits to meditate. Callaway is just blocks away and has events year round including in 2019: Symphony on the Sand April 27; Memorial weekend May 24-26 features Masters water ski and wakeboard tournament at Robin Lake Beach. All summer long includes Friday night movies on the beach, FSU’s Flying High Circus, Live music on the beach every weekend. Everyday adventures: TreeTop Adventure zip-line through the Gardens, Butterfly Center, Birds of prey shows, golfing, fishing, putt putt golf, swimming, skiing, family fun activities. Labor Day weekend features: Hot Air Balloon Festival August 30-September 1 with antique car show and live music all weekend on the beach. Just before Thanksgiving Fantasy in Lights begin featuring 8 million lights to view in themes as the trolley carries you through the gardens. For more information on events at Callaway Gardens, please go to Callawaygardens.com Also, visit the Wild Animal Safari in Pine Mountain, Ga. it’s fun for the whole family to hand feed all the animals with its drive through safari and the Walk-a-bout. Pine Mountain also has a fun farm for an all day adventure. Butts Mill Farm is great for all ages and porch swings and rocking chairs for adults. They have a very large collection of antique cars in their museum. A grist mill and a covered bridge with porch swings over the creek to stay cool. A short drive over to Warm Springs where you will go back in time to President Roosevelt’s “Little White House”. Visit the museum from that time period, tour his home and the pool that he swam in during his therapy for polio.
? ?6 minutes to Ft Benning? ?Free soaps~parking~Netflix?? 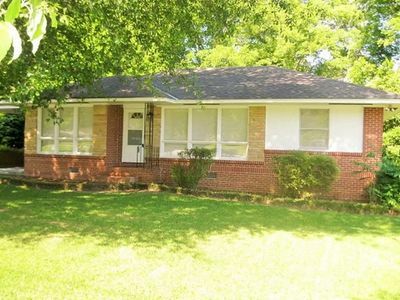 *This quaint 3 bedroom (extra den for a 4th bedroom), 1 bathroom home is conveniently located to everything in Columbus. 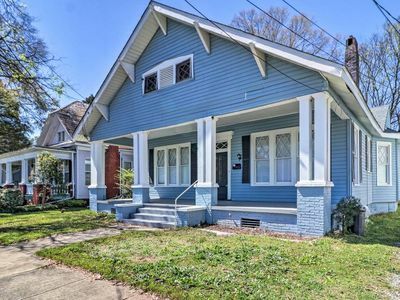 Minutes from the highway, Ft Benning, and Uptown Columbus. *Ample parking in the driveway or on the street. *A queen bed in each bedroom. *Basic kitchen items are available. *Washer and dryer available for use. *Netflix, Hulu, and cable on the big screen for lazy days or nights. *Free shampoo, conditioner, and body wash for your convenience makes it easy to bypass security on your travels. Enjoy your stay!